With the curtain having closed on Anne of Green Gables, we have barely had time to stop and reflect on how much of a lovely success it was, and how much fun, before diving right into the next show. Such is life at Riverfront – heck, we’re even busily making decisions about next season! But let’s stop for a second. Anne of Green Gables was FABULOUS. We had so many people come out to see it – really wonderful attendance. Right around a thousand people saw it in one incredibly busy weekend. And they were loving it – the audiences were laughing, and clapping, and the ripples of shock at key dramatic moments were so warming – we felt that everyone in the audience was so much on our side with this show. We had a very, very smooth weekend, and couldn’t be happier about how things turned out. Thank you, everyone – actors, crew, audiences, sponsors – there’s a lot to be proud of in what we accomplished together with Anne of Green Gables! The simple fact of the matter, though, is that in theatre, you just can’t sit back and rest on your laurels. We were back in rehearsal on Saturday, March 3rd, and all our attention is turning back to Seussical. We’ve been working on it all year in tandem with Anne of Green Gables, but we had a bit of a tidying and a refresher on Saturday, ready to really move into high gear. 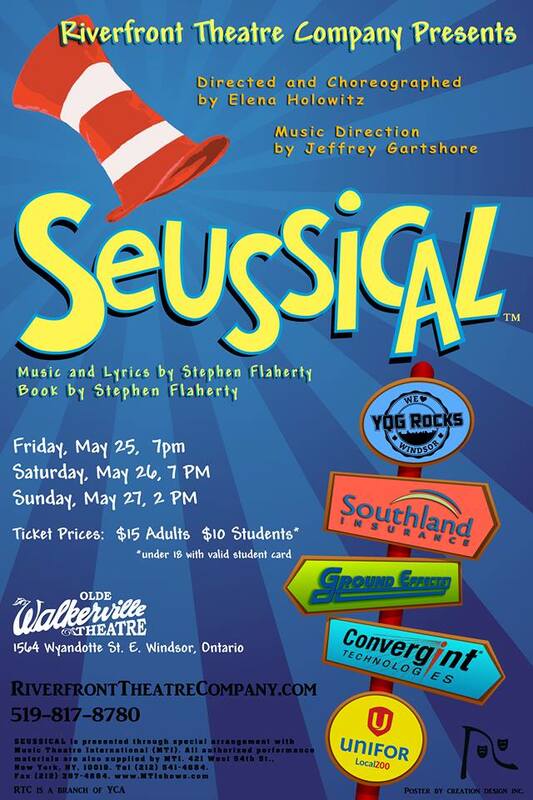 Our upcoming production is the last week in May (May 23-25th) at the Olde Walkerville Theatre. The kids are having a ball with this show, and the school performance sold out ridiculously early, so we think that our community is keen to see us perform it. We’ll be giving you plenty of sneak previews and updates in the next few months. Here’s a link to a vocal review of one of our songs. We did it as a Facebook Live video, I’m afraid, so this is the only way I can share it! If you’re wanting to dive right in and purchase tickets for Seussical, of course we’re glad to help you with that! You can purchase them online already at Eventbrite. You can get them from cast members, and you can get them at the Box Office soon – and every day of show one hour before the performance. Previous: Previous post: Opening This Weekend! Next: Next post: April 2018 Update & SPONSORSHIP REQUEST!